Room reservations are confirmed after guarantee with credit card or pre-payment. Note that same-day online bookings are only accepted until 05:00 pm. Please contact us by phone if you wish to book a room for today after 5:00 pm. Read the terms and conditions for more details about booking with us. While I was staying there, I sometimes forgot I was in Africa. Meals were very high quality and so delicious, rooms were very clean. Wifi is very strong and speedy. They produce electricity by solar power, so even when the entire city is out of power, this hotel has electricity. I've been in Africa for almost 6 months, but the experiences at this hotel was quite different from any other place in Africa! I really recommend Dutchess. We spent 2 nights in Dutchess Guesthouse. The beds were so comfortable and the rooms were well equipped and modern. The Guesthouse is in a great location and you can walk to the main street of Fort Portal. The restaurant overlooks a nice garden and it was a pleasure to enjoy our meals on the terrace enjoying some sunshine and greenery. The food was really delicious. very personal flair. we stayed there for 2 weeks. Very nice staff. They give you a lot of helpful information on possible activities. Food is very good as well. The garden is beautiful. Large, comfortable rooms, great food & great service. The whole place is managed really well and one can see the efforts which is put in even keeping small details nicely which gives the Dutchess a nice atmosphere. We have been to many hotels around Uganda and I think we never stayed at a better place at this budget. 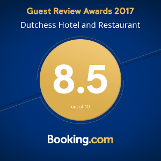 We had a great stay at Dutchess. The rooms are nice and tidy and our room had a ingenious mosqiuto-net. The owners and staff were very hospitable and made us feel right at home. The food was excellent, probably the best during our 4 week trip through Uganda. Great and inexpensive hotel perfect base for a visit to the Fort Portal area for those on a budget. Rooms are well equipped with great ensuite facilities, safe, tv, mosquito net. Free wifi is pretty good too. Food is also excellent - cannot recommend highly enough. This place could the #1 restaurant in all of Uganda! Ok so maybe my title is a bit of an exaggeration, but the food is incredible. Dutchess offers excellent-value boutique rooms with plenty of flair, big beds, couches and snazzy bathrooms. Look no further if you are hunting for a descent place to eat while in Fort Portal. Delicious dishes, prompt service, informed staff - all this packaged together in this remote town! unbelievable. The Dutchess is wonderful. Great comfortable rooms, fantastic food and the best staff. My three week stay was just delightful as I was treated each day to a delicious European style breakfast. 2016 Dutchess Hotel & Restaurant. All Rights Reserved.